On January 26th, 1985, the keel of USNS Indomitable (T-AGOS-7) laid down in Tacoma, Washington. A Stalwart-class ocean surveillance ship, she was one of eighteen vessels designed during the Cold War to provide anti-submarine warfare support through the collection of undersea acoustic data. When the Cold War ended, the Navy modified the Indomitable, along with her sisters Stalwart and Capable,for use in counter narcotics surveillance. Over the next decade (1993-2002), Indomitable sailed two missions per year, primarily in the Caribbean Sea and Panama Canal. Accompanying her 18 civilian crew members were 15 Navy personnel who were responsible for sensor operation and coordinating with other legal authorities. USNS Indomitable, circa 1998. Photo from Wikipedia. In December 2002, the ship was retired from Naval service and transferred to the National Oceanic and Atmospheric Administration (NOAA). Now called NOAAS McArthur II (R 330), or “Big Mac”, she became a hub of research activity. Able to carry 38 people, she completed her missions with a complement of officers, engineers, scientists and other crew members. Her onboard resources included both wet and dry laboratory freezers, an oceanographic laboratory refrigerator, and two oceanographic winches on deck, as well as moveable A- and J-frames and a 2.3 tonne capacity deck crane with a boom that could extend 14 metres. All of this, and much, much more, meant “Big Mac” was an ideal vessel for sea exploration. “Big Mac” tied off in port. Photo from Wikipedia. 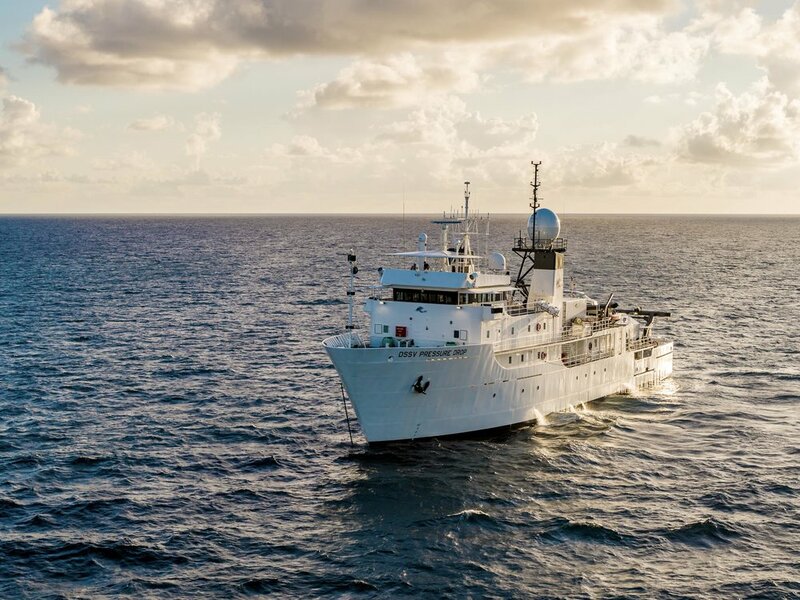 Sailing from her home port of Seattle, Washington (the other side of the continent from her USNS days), she conducted oceanographic research and assessments along the eastern Pacific coast. This included studies of several national marine sanctuaries along the coasts of Central and South America, and more general oceanographic research. “Big Mac” became inactive in 2011, and finally retired from service with NOAA in 2014. Unfortunately, the current U.S. Government shutdown means I can’t find more information on this vessel – all of NOAA’s non-essential webpages are offline. If anyone has any more information about her, please let me know! In 2017, Caladan Oceanic LLC bought McArthur IIto turn her into the home of a brand-new manned submersible. Renamed the Deep-Sea Support Vessel (DSSV) Pressure Drop, she went through a comprehensive refit in 2017 to update her accommodation and science spaces. This included fitting a brand new, 12-tonne A-frame launch and recovery system to her stern and adding a retractable submersible hanger to her deck. Her range was now over 15,000 nautical miles (27,780km), and her new accommodation spaces could hold 46 passengers, with an additional 16-18 crew members. An infographic showing the new additions to the Pressure Drop. Image from Five Deeps Expedition. All these updates were critical for the crew’s expedition plans. Beginning in December 2018, the Pressure Dropembarked on an ambitious venture. With the financial backing of investor Victor Vescovo, the Pressure Drop will send her manned submersible, the $48 million DSV Limiting Factor, to the bottom of the world’s five oceans. Launching Limiting Factor from the stern. Image from Five Deeps Expedition. Designed specifically for these missions, Limiting Factor (a Triton 36000/2 Hadal submarine system) can withstand the immense pressure that exist over 8 kilometres underwater. 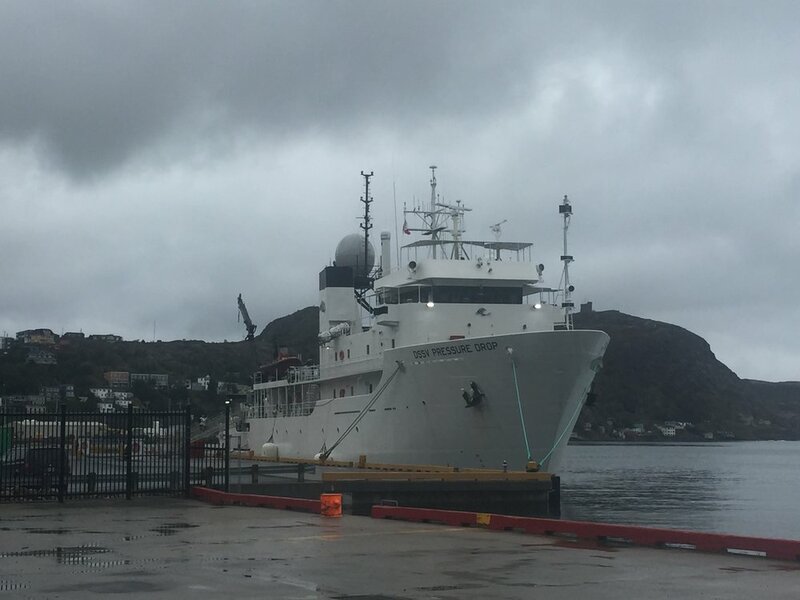 She’s outfitted with technology to bring samples to the scientific teams waiting at the surface, which will help develop a more thorough understanding of the depths of our oceans. Many researchers, including the head of the scientific team Dr. Alan Jamieson, have pointed out that we know more about the lunar surface than we do the depths of our oceans. The team on board Pressure Drop hopes to fill in some of that gap. On December 19th, Vescovo became the first human to reach the bottom of the Atlantic, visiting the Puerto Rico Trench at 8.4 kilometres below the surface. Still remaining are the South Sandwich Trench in the Southern Ocean around Antarctica (6 kilometres), the Java Trench in the Indian Ocean (7.3 kilometres), the Mariana Trench in the Pacific Ocean (10.9 kilometres), and the Molloy Deep in the Arctic Ocean (5.6 kilometres). By the end of the mission, the team will have travelled 49,000 nautical miles (90,748 kilometres) and through 72 kilometres of water in 11 months. Vescovo used the “Culture” novels as source material when naming the ship, sub, ROV’s and other support vehicles. Inspired by this science fiction series, he considered it a homage to the work of the author, and the spirit of technology moving humankind forward. You can read more about this, and the other names he selected, here. Keep an eye out during February for the next dive! I’m excited to find out how the expedition unfolds. At anchor while at sea. Image from Five Deeps Expedition.